After much research on how to appropriately represent the armed forces on special Anzac Day Candles, the helpful staff at the Auckland War Memorial Museum assisted us with these images. Photos were taken of stained glass windows in the Hall of Memories with the insignia of the army, navy and air force. 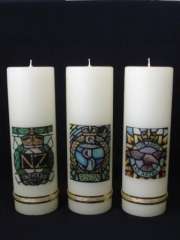 The candles measure 300mm in height and 95mm in diameter and have a burntime of approximately 280 hours. For more information and photos on this project, please click here. Please contact us today to discuss your own ideas and requirements.